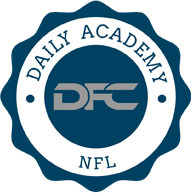 There are many kinds of game types in daily fantasy football. With a player pool that is much larger than all of the other sports, as well as the contests only being run once a week, it gives you an excellent opportunity to diversify your action more than you are able to in daily sports like basketball and baseball. NFL season truly gives you a chance to game select for cash games. Cash games are any contest that gives you a good chance to double or triple your money. This can include double-ups, triple-ups, head-to-heads, three-player games and sometimes other contests like triple-doubles and five or six player contests depending on the site. Getting a good mix of these contests is important to having a healthy bankroll. Generally, it makes sense to allocate an amount of money to cash games and play about one third of that money in head-to-heads, one third in double ups and then mix the other third among those other listed game types for true diversity, but each player will need to adjust their practices to their strengths. Now that we've overviewed what cash games are and how to approach the game selection of them, let's dive deeper into some strategy. The biggest thing to remember about cash games is there is no extra prize for having a ridiculously high score. Sure, it'll feel great to take 1st in a 100-player double-up, but you're getting the exact same prize as the players who finished 49th and 50th. That's important to remember, because in football more than any other sport, there are major differences in player types that can be used to your advantage. 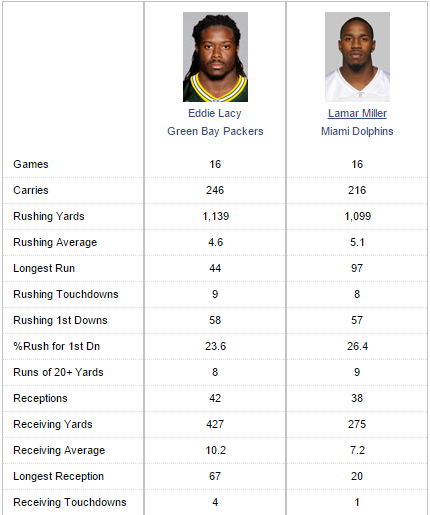 One great example of this from the 2014 season was Eddie Lacy and Lamar Miller. Lacy started the season very slow and had some major up and down weeks along the way, while Miller was uber-consistent with his scoring. While many considered Lacy a strong cash game play because of the explosive Packers offense, the guy you really wanted for a slightly lower cost each week was Miller. Let's compare the two's season totals below. As you can see, they had very similar seasons, with a slight edge to Lacy due to volume, which was obvious in their price differences throughout last season. Now let's compare them on a week-to-week basis. The red line is the player's actual production, while the grey line is the running back average for that week. As you can see with Lacy, despite the high-powered offense he was in, he really struggled in a lot of games early in the season, posting below six fantasy points in four of the first eight. He turned it on later in the season and became a much more viable cash game play, but it took more than 10 weeks before he was a guy you could truly count on in them at his price. Miller on the other hand was over 10 fantasy points in five of the first six games, as well as over nine fantasy points in seven of the first eight games of the season. He didn't wow you with 20+ fantasy point games like Lacy until the last two games of the season, but he never posted back-to-back games with less than nine fantasy points, making him a dream cash game play at the prices he was hovering around all season as the big games like Lacy was having are the ones that really drive your price up. Being able to find price efficient consistency like Miller provided last year can be a huge advantage in cash games over people trying to strike gold with a guy like Lacy for a much steeper price. As mentioned above, there's not reward for finishing at the top of a double-up field and while a 20+ fantasy point outing can make up for other mistakes, you can avoid those mistakes quite often by selecting the right players at the right prices in cash games. The biggest thing about cash games is you don't need to keep jamming the “top plays" into your lineup because price is much more important. When trying to fit really high-end players into your lineup it generally forces you to play players at other positions who simply can't provide value for their price. Roster construction should definitely vary week-to-week given the options available and the pricing for that given week on any site. There won't always be guys like Lamar Miller who are priced too low due to their consistency and lack of upside. If there are injury replacements that are very cheap, it can change the entire roster construction that week as they'll likely be heavily owned and provide massive profit potential on their prices. This will allow you to grievously raise the average price of the rest of the players on your roster or maybe even fit one or more of those top plays into your lineup. The bottom line is, you should feel comfortable with every single player in your lineup for their price in your cash game lineup.